FREE Suitable for all ages! Unit 18, Puppet Place HQ, is a building bustling with creative ideas and projects. This is your chance to explore our workshop and chat with our resident artists, find out more about puppetry and animation, the craft and skills that go into creating some of our most memorable experiences on screen or stage. On Sunday come and discover the Aladdin’s cave that is our fabrication studio, have a go at stop-motion animation with Mary Murphy, browse through our pop-up gallery of and relax in our secret garden with a cup of tea and slice of cake, although watch out for Mr & Mrs Pigeon who are eternally curious and entirely shameless! Mr & Mrs Pigeon – comedy street theatre from Gwen Hales on Vimeo. Visit our fabrication studio and meet creative technologists Rusty Squid and discover how they are using the skills and experience of puppeteers to make robots more intuitive and friendly. 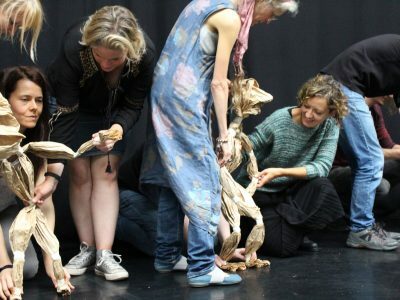 Take a look at the work of internationally renowned puppetry companies Pickled Image and Green Ginger and explore the environment in which Coulrophobia (7-10 November at Tobacco Factory Theatres) and Outpost (Green Ginger’s international touring show) were both created. Mary Murphy will be setting up a stop motion animation playzone in the studio for anyone who wants to come and have a play at puppet animation using a range of simple tools and equipment. On the other side of the building we are creating a pop up gallery showcasing the artwork of other Puppet Place Residents and our Associate Artists. We will be showing rarely seen artwork of resident artists Victoria Andrews (Co-Director Pickled Image) and Max Dorey (Set Designer). Victoria’s work as Pickled Image’s Co-Director and Designer is internationally respected, Max is an Offie nominated set designer whose skills are in high demand in the West End. Victoria’s onstage design flair and illustration skills cross over into domestic settings with decoration and ornamentation inspired by kimono designs and the folk art of Lisbon and Scandinavia. She will also be showing paintings inspired by her love of pattern. Taking the silhouettes of animals, skeletons and crustacea as her starting point, Victoria uses pattern and colour to imbue her subjects with character and movement. Inspired by wallpaper designs and patterns, these paintings are playful, intricate pieces that draw you in to a story. Max Dorey has always had a love of model-making and it is integral to his work as a set designer: enabling him to share the narrative of the set design with directors and performers prior to the build. For the pop up gallery, Max is creating models that are ready and waiting for a story of their own. Committed to ideas of re-use and sustainability, Max creates models out of the scrap bins from the fabrication studio. This makes every model unique and a reflection of the varying Puppet Place aesthetics. Driftwood beach-huts tottering precipitously on elongated stilts, resonant with the survival instinct and isolation of sea-forts and fishing huts of Norway. Trashships hint at the desire for community living and collective thinking to survive as a society. Sharing the pop up gallery with Max and Victoria will be resident artist Beki Wills. Beki is a multi-disciplinary artist whose work encompasses music, photography, design and painting. 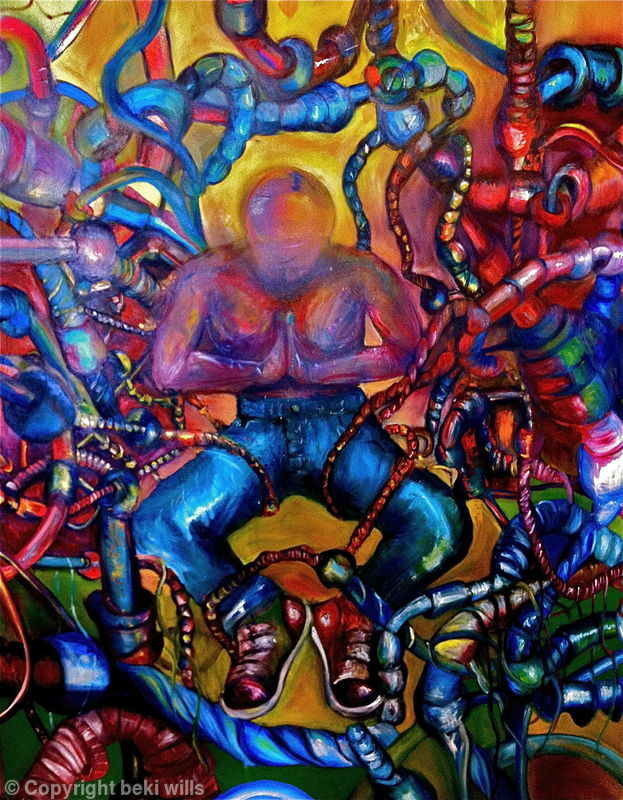 For the pop up gallery Beki is putting together a series of paintings that represent her personal narrative of the contemporary political scene. Reflecting on the political chaos in the wake of the BREXIT result, the increase in racist incidents and the polarisation of society, Beki’s work is heavily influenced by war artists, Russian and Chinese propaganda art. Using a mix of oil and spray paints, Beki’s paintings are a deeply personal exploration of an uncertain self-identity in a mainstream society where the economic benefits of global living are highly prized, while the responsibilities of the global village are often forgotten. Emma is an Associate Artist at Puppet Place. She is an animator and designer with a passion for the Gothic, the macabre and the downright odd. 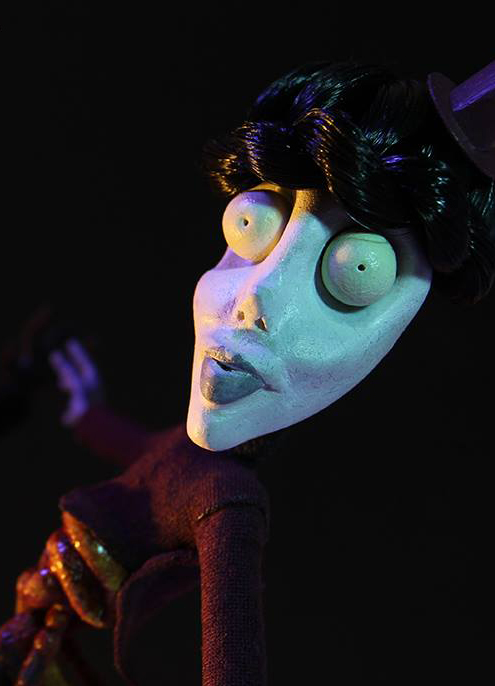 Her true love is for stop-motion animation and she has produced several films that use various stop-frame techniques. 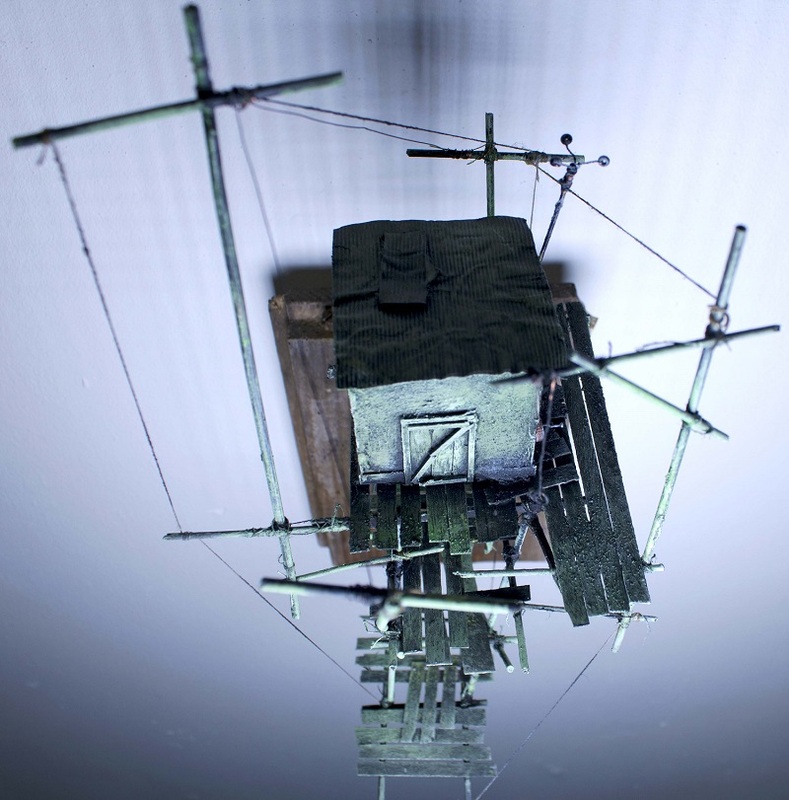 At Doors Open Day, she will be showing some of her short films and modelmaking work. She is also the Editor of Puppet Place Newsletter. 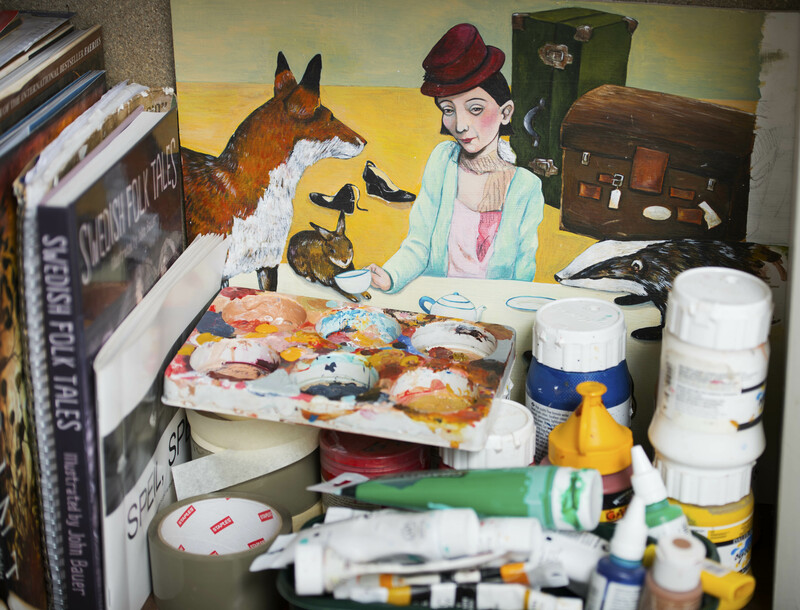 Tallulah is an illustrator working in mixed media. She graduated from Falmouth University in 2014 and is now to be found in Bristol either working a way at Puppet Place or by a windowsill with many plant pots. 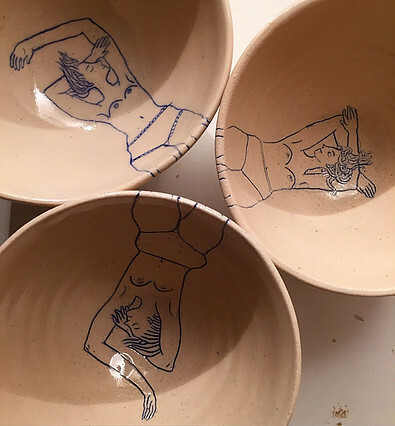 For Doors Open Day, Tallulah will be showing a collection of her illustrated pots. Lucy is a collaborative live artist, project manager and event facilitator. Having enjoyed dressing up from an early age it was an easy progression to the world of burlesque and onwards to live art. 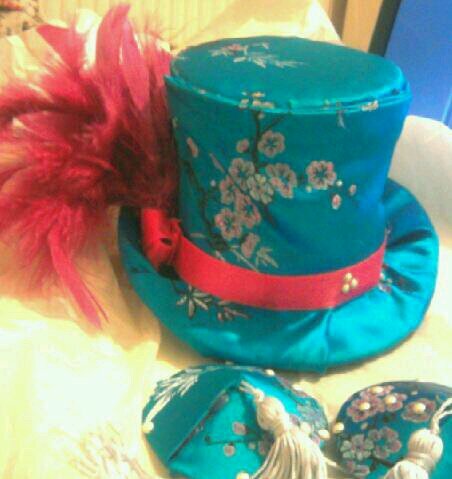 Lucy has made a range of hats, fascinators and pasties for all kinds of events including cabarets, operas and even the odd wedding. Lucy regularly runs workshops for hen parties across the South West.